LOS ANGELES — UCLA gymnastics head coach Valorie Kondos Field, who has led the Bruins to all seven of their NCAA championships, will retire from her head coaching position following the 2019 season. Kondos Field will enter her 29th and final year as head coach and 37th year on the UCLA coaching staff. She began her coaching career as an assistant coach and choreographer in 1983 and became the head coach in 1991. Six seasons later, in 1997, she led the Bruins to their first-ever NCAA title, and they have gone on to win six more team titles, including the most recent in 2018. "I have had the immense privilege and pleasure of serving this university and athletic department for the past 36 years," Kondos Field said. "UCLA has offered me opportunities that I could never have dreamed of, from a world-class education, to being part of an athletic team despite never having played organized sports in my life, to being able to mentor and teach life lessons to incredible young women. I have enjoyed every moment of this journey, and I will deeply miss all of the wonderful people that make up UCLA Athletics, and, most importantly, the daily interaction with our student-athletes, coaches and staff. However, I will forever be our most ardent supporter and look forward to continuing the dance in a different role but always as a proud UCLA Bruin." "It is with incredibly mixed emotions that I accept and support Val's decision to retire following this season," said UCLA Athletic Director Dan Guerrero. "Val embodies everything you look for in a head coach: she builds genuine relationships with her student-athletes; she's a tremendous mentor, not only in the gym, but also in life; and of course, we all know, her teams have been incredibly successful. In winning, most importantly, she fosters this success the right way, by creating a culture of positivity and growth that has elevated the UCLA gymnastics program to new heights, among the nation's most elite. We are so grateful for her contributions, and we look forward to celebrating them with the Bruin Family during her final season." With seven NCAA championships, 19 NCAA regional titles, 14 Pac-12 championships and a career coaching record of 516-120-3 (.810) in 28 years, Kondos Field is one of the most successful head coaches in NCAA gymnastics history. 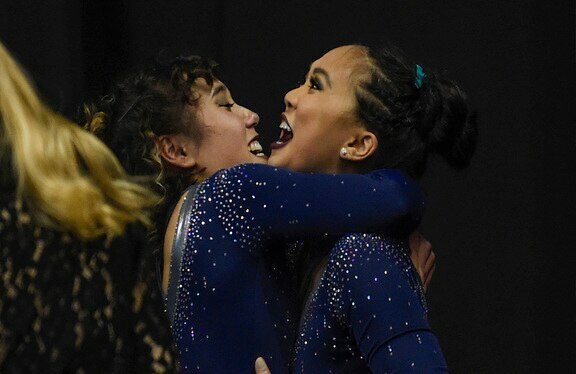 After seven @NCAA Championships, 19 NCAA Regional titles, 14 #Pac12Gym Championships, and impacting countless athletes’ lives, @OfficialMissVal gives an emotional retirement announcement. The Pac-12 Gymnastics Coach of the Century, she became the second active coach ever to be inducted into the UCLA Athletic Hall of Fame when she joined the class of 2010. Kondos Field has been selected by her peers as the NACGC/W National Coach of the Year four times (1996, 1997, 2000 and 2001) and was also named the Pac-12 Coach of the Year in 1995, 2000, 2003 and 2012 and the West Region Coach of the Year in 2018. In 2017, she was honored as a Women of Inspiration Award recipient by the Los Angeles Chapter of Women in Sports and Events (WISE Los Angeles). A former professional ballerina with no previous sports or athletic coaching experience, Kondos Field crafted her own unique path to coaching success. Inspired by her mentor, legendary UCLA basketball coach John Wooden, she instilled a coaching philosophy that stresses balance and integrity in all facets of life and emphasizes that life is a choice and the choices you make in life dictate the life you lead. That mindset helped Kondos Field immensely in 2014 when she was diagnosed with breast cancer. She adopted a positive outlook during her treatment and is now cancer-free. In the past year, she has become a highly sought-after public speaker and new author of a book, "Life is Short, Don't Wait to Dance", which will be released on October 2. Her book shares insights on how to use uniqueness and authenticity to achieve success. "I have always thought of life as a grand adventure," Kondos Field said. "Since conquering breast cancer, I have been motivated to delve into the many different areas that inspire me. I wrote a book; I have dramatically increased the volume of speaking engagements I accept; I have film and theatre productions in the works that I am passionate about producing; I'm excited to continue the work I do with SeaWorld; and I am honored to continue advocating for cultural change within our national gymnastics organization. While I will always be inspired by these tremendous young women I have had the pleasure of coaching, I feel that now is the right time to take these new challenges head-on." Kondos Field's final season begins the first week of January when the Bruins host Nebraska in Pauley Pavilion.